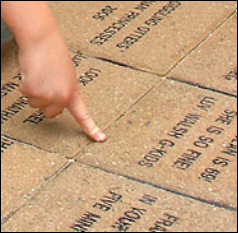 What is an Engraved Paver? ​One service the Friends of Hemlock Bluffs provides is the installation of engraved pavers in the courtyard of the Stevens Nature Center at Hemlock Bluffs Nature Preserve. The sale of engraved pavers is the one on-going fundraising project of the Friends of Hemlock Bluffs. Purchase a paver for $100 and engrave a personal message, honor a friend or a pet - it's a gift that keeps giving day after day! Pavers have been purchased for a variety of reasons over the years; in memorial for a loved one, as a love token year after year, and even as a marriage proposal! What unique way can you think of to "carve your name in stone"? When pavers are installed, the Friends organize a dedication ceremony and invite both those who ordered the pavers and those to whom they are dedicated. We currently try to have one dedication ceremony each year. We can only conduct this event if we meet our minimum order number required by our paver engraver. Typically orders placed in the beginning of the calendar year are recognized in the Fall of the same year. ​If you prefer not to order an engraved paver online, you may download the order form below, Print it out on your computer and mail it to the Friends of Hemlock Bluffs with your $100 check to: PO Box 62, Cary, NC 27512. Thank you for your interest and your support. Paver orders may be returned if we are unable to fulfill the order for any reason. The engraved pavers are installed in a public walkway and are subject to all types of weather every day all day. We can not guarantee the longevity of the engravings.